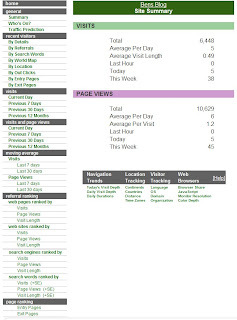 I've used Site Meter for a long time on a variety of web pages including this blog. It's always been a solid set of statistics and very dependable. 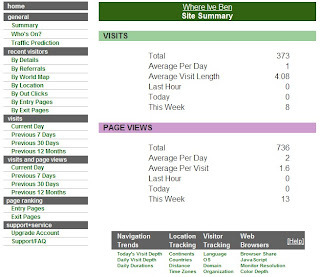 This spring, when I went to check my statistics on this blog, I got some odd results. The problem has since been corrected. I quickly hit PrtSc and captured the erroneous output. Being the nice guy that I am, I e-mailed it to Site Meter. 2 days later I got a reply. Thank you very much for sending this through. We attempted a launch of the new sitemeter site on Tuesday. Unfortunately we encountered problems and had to revert back to the old site. This information was useful as we tried and diagnose the problem. I have upgraded you to a Free lifetime paid account for taking the time to send this along. Now, I wasn't familiar with the "paid" Site Meter account so here's the difference. Above is the "free" service. Above is the "Plus" service.